Sebastian Blanco attacked all day versus Atlanta, but had no help. I know that sports mirrors the real world, but in terms of absolute strangeness. the match between the Portland Timbers and Atlanta United will go down as one of the most bizarre matches in MLS this season. In the first ever meeting between the sides - with Atlanta joining the league this year - that touted the two best offenses within the league in terms of goals scored, the game ended up being anything but an offensive display for the majority of the time. 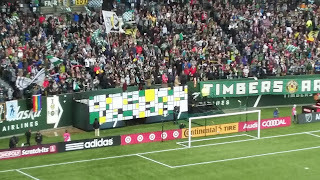 While both teams scored a goal apiece that ended up being the only tallies for the day in a 1 all draw, this match will more be remembered for an extremely odd sequence that put the league's concussion protocol into question, very questionable officiating, a strange hand ball sequence in the Timbers box, a shot that nearly won it for the home side in stoppage, odd television coverage and some truly awful passing. 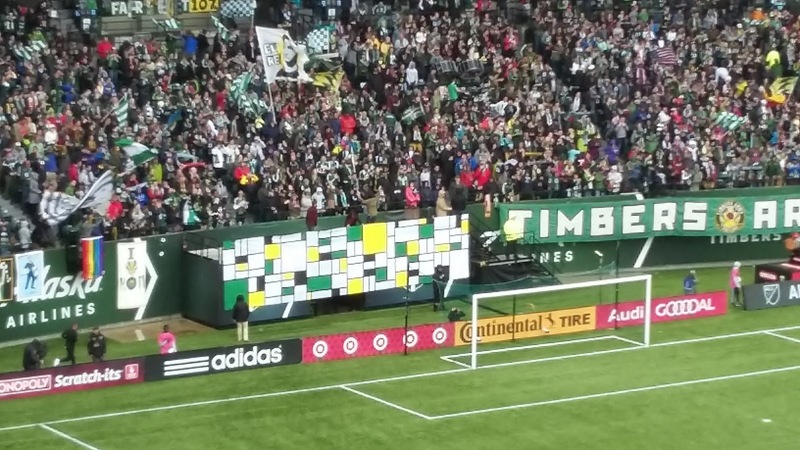 While many will ultimately say the result was likely fair for both sides, what was frustrating for most of this match was the fact that the Timbers ultimately played a passive match and it cost them points. Portland came into the match sitting in 3rd in the Western Conference standing, but reeling from one of their worst defeats of the season down in San Jose last weekend by a 3 to 0 thrashing. 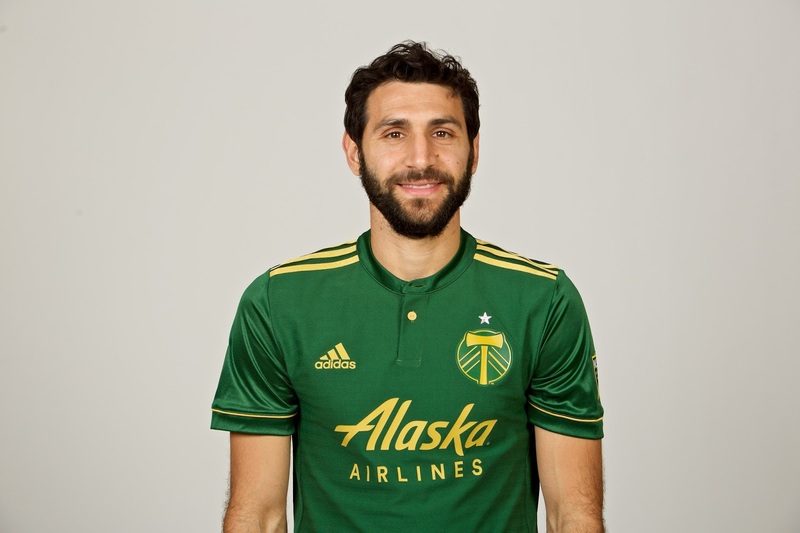 To be fair, Diego Valeri and Darlington Nagbe, the team's two best playmakers, were not available for the Earthquakes match, so it was with some relief that Timbers Coach Caleb Porter indicated that Valeri had been in training and would likely be available for Atlanta. Sure enough, the Maestro was included in the starting 11 in his usual attacking midfield role with Sebastian Blanco and Dairon Asprilla supporting him on the wings. With Fanendo Adi up top and David Guzman and Diego Chara fulfilling their usual roles as target forward and central holding midfielders, the defense saw some rotation within its quintet of performers. Jake Gleeson had cleared all protocols and was given the start in goal with Kendall McIntosh set as his backup with Jeff Attinella unavailable for the match. After Lawrence Olum had started the last 10 matches in a row, Porter gave him the day off and put Roy Miller at center back alongside Liam Ridgewell with Alvas Powell and Vytas flanking as the fullbacks. Porter could reach out to his bench for defensive subs in Lawrence Olum, Zarek Valentin or Marco Farfan, or help the offense if needed with Jack Barmby, Darren Mattocks or Victor Arboleda. It's not a rorschach test if you were curious. Atlanta's offense has been the talk of MLS this year, mostly for being a club just built in the offseason. Their management invested in several younger but extremely talented players in Yamil Asad, Josef Martinez, Hector Villabla, Julian Gressel, Carlos Carmona and Miguel Almiron, but they surrounded the core with several MLS veterans like Tyrone Mears, Jeff Larentowicz, Michael Parkhurst and recently acquired Mark Bloom. Atlanta United Coach Gerardo Martino loves to play an attacking, interchangable style much like what we see from the Timbers and Porter, so it would be interesting to see how both sides would choose to attack each other. Portland was getting a slight break with Martinez unavailable due to injury, but the foursome of Asad - Villabla - Almiron - Gressel is one of the strongest scoring groups the Timbers defense will see all year. Atlanta can even bring experienced scorer Kenwyne Jones off the bench if they needed a spark later on, but as with the Timbers, Atlanta's fortunes rest with whether their backline led by Parkhurst and goalkeeping with Alec Kann will be enough to stop other sides. The offensive outbursts in the game happened within the first 5 minutes of the second half. Atlanta took the kick immediately and drove it to Larentowicz, who fed Gressel just outside the box in space with no Timber closing. The Atlanta midfielder easily turned and shot it past Gleeson before most folks had even returned to their seats after the break, but Portland equalized four minutes later off a free kick when Chara was leveled to the turf by Carmona. Guzman took over the set piece duties from a recovering Valeri, and expertly found Ridgewell clear of marks and free, and he expertly headed the ball off the turf under Kann to level things at the 50th minute. There was an expert Gleeson block in the 44th minute off a shot that was created by exceptional interplay from Asad and Almiron, while Kann turned away an Adi effort in the 72nd minute that led to follow up shots from Blanco and him that were also blocked. Perhaps the best shot of the match was taken by Guzman after a corner in second half stoppage when his restart was deflected by the wall and headed by Adi right to Guzman. He onetimed the shot right on frame and Kann wasn't able to stop it, but the left post felt otherwise and bumped the effort away and back into play before Atlanta could clear away the effort. In a match of great offenses, however, this was the extent of the flourishes. The Maestro was back but not 100 percent. Soon!!! For me, however, the more newsworthy thing about the match was that for a matchup of the two best offenses, it was surprisingly sluggish for both sides. While Atlanta dominated possession - by a 70 to 30 percent margin for the match - they tallied just 1 shot on goal in the 1st half and just 2 shots on target in the 2nd. Portland conceded possession and passing attempts in a desire to play defensively and create chances where they could, and they certainly had the advantage in shots and dangerous chances. The Timbers kept Almiron under control for most of the match, while Asad and Villabla didn't threaten too much, but it ended up being Gressel that was the difference maker for Atlanta. Blanco was the Timbers' main offensive threat as Adi either rushed shots, fell down trying to initiate contact, or had shots blocked although he certainly got bumped enough to earn more calls. While Valeri was present, you could tell his timing and fitness were not up to standards and Atlanta neutralized him on the few times that he was able to get free. Perhaps the worst part of the Timbers' offense was the work of Asprilla and Powell on the right; Asprilla was responsible for more misplays off the first touch than I've seen in quite a while on quality link passes, while Powell continued his disturbing trend of passing to everybody but the guys wearing the same color kit. The strangeness bled over to a few other areas, as the match was broadcast on ESPN on the same day as their all day Jeter-fest as the New York Yankees were retiring his number. There are few franchises I despise more than those guys, but even during the match, it was a constant torrent of news about things that would be broadcast later during that ceremony that kept getting distracting. The broadcast also missed a developing news story in the 11th minute when Powell tried to clear a ball away and struck Asad squarely in the head. On the replay, it appeared that Asad lost consciousness as he crumpled to the turf and center official Alan Kelly immediately called for treatment as he laid on the turf. What was odd was moments later, Asad approached the fourth official to re-enter the match and he was allowed to re-enter. The story appears to be that Atlanta doctors indicated he should be replaced to allow them to do more testing, but Asad refused to leave the match and decided to play anyway. Suffice to say, there will be plenty of questions about the protocols after this incident because it did appear that Asad was out for several moments due to the impact of Powell's inadvertent kick and likely should have been substituted. Kelly and his crew got into more hot water in the 36th minute when Carmona took down Blanco with a scissors tackle at midpitch. Kelly gave Carmona a caution, which seemed awfully light although there was plenty of other contact between Adi and Atlanta defender Leandro Pirez nearby. Kelly can be either hit or miss as a center official, and on this day, his calls seemed to be misses for both sides as he let plenty go by the wayside. Lawrence Olum got the match off, but he could be very busy soon. There were plenty of other oddities on the afternoon - Adi flailing and appearing to contact a ball with his hand in the box, multiple Atlanta players falling down at the slightest contact and Pirez talking to Kelly at great lengths on many occasions - but in the end, the teams finished how they started with sharing the points. While I can understand the logic that it's an Eastern Conference opponent and there is no ground lost in the draw in the playoff chase, I was hoping to see a Timbers team regain some confidence after thoroughly being outplayed the last weekend by what I deem an inferior Earthquakes side. Portland will be just fine when they have perfectly healthy versions of Darlington Nagbe and Diego Valeri, but with international callups, injuries and regular rotation, I'm not convinced this team has figured out how to play quality offensive soccer if one or more of them are missing. Porter did say that Nagbe is very close to returning and he would likely be ready for the next stretch of road matches - in Montreal on May 20 and in Seattle on May 27 - but Guzman and Nagbe will be gone for parts of June for international duty, so they need to figure this out and fast. Porter indicated that Olum would was signed as depth for the defensive midfield, so that could mean with Guzman out, we could see a Chara - Olum pairing in front of a Miller - Ridgewell center back duo.